The best alternative of Camtasia to record and edit your video without black screen. The black screen issue is often related to a simple setting that isn't adjusted properly, which is the reason why users must make sure that everything is functioning properly before starting a recording session. If you would like to install Camtasia 8 or Camtasia 9, you will need some of the latest versions of Windows operating system to be able to exploit the full potential of this screen recording software. At times, antivirus software may be the reason why Camtasia displays black screen instead of your videos. Here is how you can solve the black screen error with just a few clicks. Although it may be a little frustrating, solving the black screen error in Camtasia 9 is not very difficult. The issue occurs during the screen capturing process or when videos are imported into Camtasia Video Editor and placed on the timeline, but once the file is played the editor's screen doesn't play video or the sound. Rest assured that nothing is wrong with your videos since the problem is caused by the Hardware Acceleration System-Wide setting. To resolve the black screen issue during screen capturing session issue, close Camtasia and right-click on the desktop. Select Properties > Settings > Advanced > Troubleshoot and set the Hardware Acceleration to None. After you've completed this action, restart the software and start a new recording session. This will solve the issue in Windows XP, but for Windows 7,8 and 10 you need to change the Hardware Acceleration setting to Use Software Only. 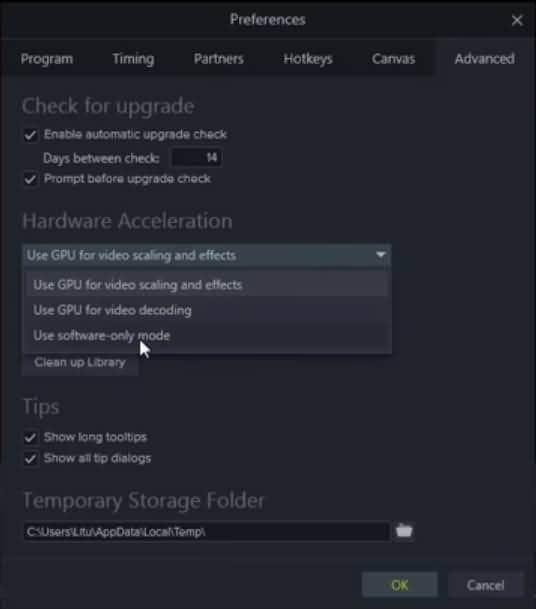 You can fix the Black Screen Error from Camtasia 9's Video Editor and to do so, go to Edit > Properties > Advanced and select from the Hardware Acceleration drop down menu 'Use Software-Only Mode' option. Click OK to confirm the changes you made and then close the program. Run Camtasia 9 again and start a new recording session to check if the software is now running properly. Hardware Acceleration settings may not be the only reason for the black screen error since some antivirus or security programs can also cause this problem. What happens is that a security software blocks the recorder's screen capture feature and the final result is that the users cannot see the footage they've created. Norton's Crime War, Webroot or Trusteer Rapport are often the reason why Camtasia cannot capture screen, but most of these programs have a white list that prevents them from intervening with the recorder. In some cases, you might need to remove the problematic software from the operating system to be able to capture your screen. Experiencing difficulties like the black screen error is not pleasant and it also reduces Camtasia's reliability. If you tried each of the solutions we talked about, but the problem persists, it is time to try using an alternative screen capturing software. Filmora Scrn is an equally capable screen recording software that provides a wide spectrum of video recording and editing options. With Filmora Scrn you will never need to waste your time dealing with issues like the black screen error, and you'll be able to create high-quality videos without any difficulty. This screen recording tool allows you to set the frame rate that bests suits the content you are capturing and with a maximum rate of 120 fps, Filmora Scrn is perfect for recording dynamic video games. Fully customizable recording field allows users to choose which part of the screen they want to capture, while the Picture in Picture feature enables you to add a second image to your footage. The modern and functional interface allows for easy navigation through the software that offers a full editing suite equipped with all the most important editing tools. Even the users without any previous knowledge about screen recording can learn how to use Filmora Scrn in a short period of time.